Capt. Janis Lullen has just finished training the first-ever female officers in the Afghan National Army. 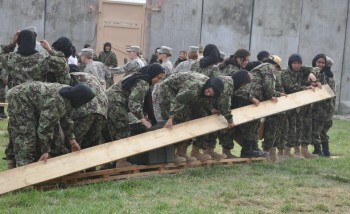 “Leadership for women, in this culture,” she notes, “is a rarity to find within the military or the professional realm. We wanted to show the country what was possible if these women were given the opportunity to serve their country.” The 29 new officers underwent 6 months of leadership, physical, finance, and logisitics training under Capt. Lullen’s guidance. Entry filed under: Uncategorized. Tags: Afghan National Army, afghanistan, asia, developing world, development, gayle lemmon, Helping Women Helps the World, Janis Lullen, south asia, women, women and war, women's development.